The Summer Carnival is organised by Arts Council Malta, with the help of the Parliamentary Secretary for Local Government and Communities, the Valletta 2018 Foundation, the Malta Tourism Authority and the local councils of St Paul’s Bay and Marsascala. The fifth edition of the Summer Carnival kicks off tonight, 25th August 2017 at 6.30pm near Gillieru with the ġostra, the popular old tradition where competitors climb a long pole smeared in fat, in an attempt to reach the flag placed at its far end. 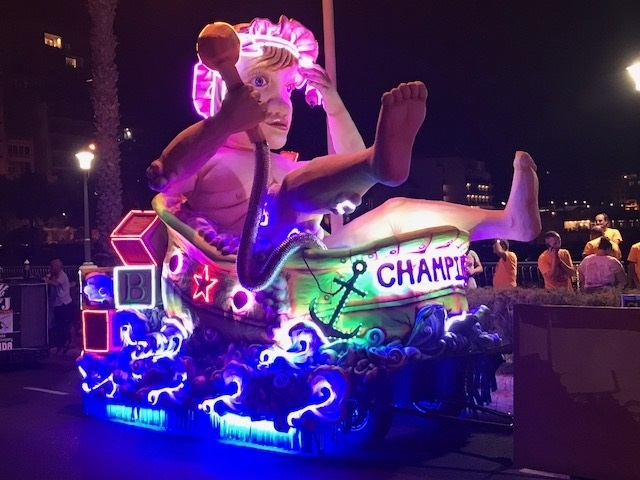 Yesterday night the participating floats were taken to St Paul’s Bay in preparation for this evening’s parade along the promenade. The celebrations start at 6.30pm near Gillieru with the ġostra, the popular old tradition where competitors climb a long pole smeared in fat, in an attempt to reach the flag placed at its far end. It will be followed, half an hour later, by a parade featuring carnival floats and dance companies, along the promenade to Buġibba Square. Tomorrow, the ġostra will take place in the area around Santana hotel, followed by a parade at 7pm that will culminate in Buġibba Square. On Sunday 27th August, the Carnival will move to the Marsascala promenade. The celebrations open at 7pm with a street parade all along the promenade in Salini Street. Starting next to the local council, it will make its way towards the area known as is-simenta where there will be dance performances and shows by the members of the respective floats. The Marsascala Band as well as Skolasajf students will also be taking part in this carnival. This Summer Carnival sees the participation of 11 floats, some of which will be accompanied by their respective dance companies. The summer floats are smaller than those of the Winter Carnival and are created especially for this carnival, with summer-related themes. In addition, there will also be 10 dance companies, three more than last year. Participants hail from many locations, some of whom also participate in the Winter Carnival. In Marsascala, patrons can park next to Inspire, in front of the St Anthony Family Part in St Anthony Street as well in the park’s carpark. There will be a park and ride service.